System which protects the driver and front passenger in the event of a serious side impact in order to limit the risk of injury to the chest, between the hip and the shoulder. Each lateral airbag is fitted in the seat backrest frame, door side. 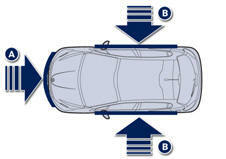 The lateral airbags are deployed unilaterally in the event of a serious side impact applied to all or part of the side impact zone B , perpendicular to the longitudinal centreline of the vehicle on a horizontal plane and directed from the outside towards the inside of the vehicle. 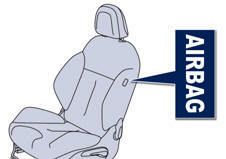 The lateral airbag inflates between the hip and shoulder of the front occupant of the vehicle and the corresponding door trim panel.